In the post 9-11 world, people are more susceptible than ever to charismatic figures who offer simple, black v. white, us v. them, good v. evil, formulaic solutions. The rise of the Internet; increasingly sophisticated knowledge about how to influence and manipulate others; and the growing vulnerabilities of people across the planet—make for a dangerous, potentially devastating combination. 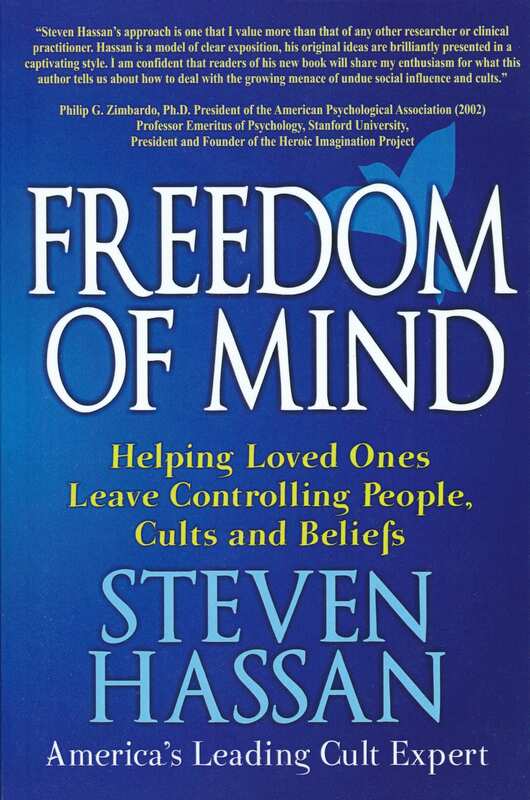 Steven Hassan’s book Freedom of Mind: Helping Loved Ones Leave Controlling People, Cults, and Beliefs provides the knowledge and awareness needed to help yourself and loved ones avoid or escape from such dangerous people and situations. This must-read volume is a significantly updated and revised edition of Hassan’s groundbreaking Releasing the Bonds: Empowering People to Think for Themselves. It provides an up-to-the-minute guide to the reality of ‘undue influence’—the preferred term for mind control—in the post 9-11 era. Freedom of Mind: Helping Loved Ones Leave Controlling People, Cults, and Beliefs exposes the techniques and methods that individuals, cults, and institutions of all types—religious, business, therapeutic, educational, governmental—use to undo a person’s capacity to think and act independently. Hassan details his groundbreaking approach, the Strategic Interactive Approach, which can be used to help a loved one. Step-by-step, Hassan shows you how to evaluate the situation, interact with dual identities, develop communication strategies using phone calls, letter writing and visits, understand and utilize cult beliefs and tactics, and use reality-testing and other techniques to promote freedom of mind. He emphasizes the value of meeting with trained consultants to be effectively guided and coached and also to plan and implement effective interventions. The best way to protect yourself and your loved ones is knowledge and awareness.